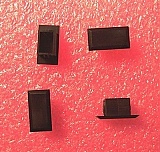 Dust caps and covers for fiber connectors and adapters. Dust cap for fiber connector with 2.5mm ferrule. 100 caps per small bag. Price is for one small bag. Dust cap for fiber connector with 1.25mm ferrule. 100 caps per small bag. Price is for one small bag. Dust cover for simplex fiber SC adapter. 200 caps per bag. Price is for one bag. Dust cover for fiber FC adapter. 200 caps per bag. Price is for one bag. Cover for panel hole (cutout) of simplex SC or duplex LC adapter. Snap in type.